Curve4 won best specialty app for 2018! In April 2018 at the Xojo Developer's Conference in Denver, CHROMiX's Steve Upton was awarded with the 'Best Specialty App for 2018' Design Award for Curve4! CHROMiX is offering a new series of YouTube videos highlighting quick tips and tricks with our Curve4 software. The first one shows how to use the Ink Restriction feature. Both Maxwell Client version 5.6 and the Maxwell Online component now support up to 7-colors. RGB and CMYK have always been supported, so 7-colors is an exciting addition. Imagine the possibilities! Ask us more about how you can benefit. Traditionally, instrument makers have provided their own software to use with their instruments. This has worked out fine, as far as it went. But if you wanted to do something outside of the box, like measure the same target on two different instruments to see how they compared, you would run into trouble because the instruments might have different target requirements or use differently formatted reference files. Sometimes you might be handed a target to measure that was created for an instrument you didn't have. So there were real limits to what could be done. CHROMiX is currently in the unique position of driving many of these instruments from a single core source of software code. The measurement module that is in Curve4, the Maxwell Client (and eventually other CHROMiX products) is consistent across the various instruments, and accepts the original makers' reference files. You can use a Techkon SpectroDens to measure a target laid out for an X-Rite i1Pro using a reference file from Barbieri! Taking advantage of our unique perspective, we'd like to share our expertise with the various measuring instruments available today. In future newsletters we will intersperse a series of reviews that explain the features of these different spectrophotometers, what they can be particularly well-suited for, and how the instruments position themselves compared to others. We are not going to be delving too deeply into how many angels can dance on a spectral wavelength or anything, but we hope these articles will help you figure out what instruments would be good for your particular situation. Award winning Curve4 - Check it out! August 14th - 16th, 2018 - Our friend and partner Don Hutcheson will be the instructor at a G7 Expert and Professional training in Seattle at host RPI Printing. The event is sponsored by Idealliance. Don Hutcheson is largely recognized as the inventor of G7. He will lead instruction covering a multitude of print applications including digital and proofing color management, process control, and implementation. Attendees gain a thorough knowledge of the G7 methodology through hands-on practical experience, discussion, and extensive review. Idealliance promotes G7 as a global industry-leading set of specifications for achieving gray balance, and is the driving force for achieving visual similarity across all print processes. If you are in Seattle for this event, please let CHROMiX know and we'll set up a meeting. Corel released CorelDRAW Graphics Suite 2018. The new release coincided with FESPA 2018. Onyx Graphics Launched ONYX 18 Software at FESPA. Lots of interesting bits in here. One of the most interesting is: "is the first solution compatible with iccMAX"
Looks like X-Rite is beta testing a version of i1Profiler that takes care of issues importing CGATS files with certain decimals values, that was also reported by some Curve4 users. No ETA yet though. Royal Wedding in HDR: The BBC, British Broadcasting Co., recorded and produced an HDR (High Dynamic Range) version of the recent royal wedding. They talk about some of their challenges, including color. You might find this interesting, especially if you follow the royalty and color. Speaking of HDR, what is it? : Eizo does a nice job explaining HDR. Be sure to read all 4 tabs. 64-bit transitioning to 32-bit on macOS: This is the most official explanation from Apple for their 64-bit transition from 32-bit so far. It's a bit vague...and the "final transition dates have not yet been established" is also vague. In short, you may see a warning the first time you launch a 32bit app, but otherwise they'll run fine. Our preliminary testing with the upcoming Mojave release of macOS 10.14 indicates that 32 bit apps WILL continue to be supported. CHROMiX apps are currently 32bit and we're working toward the transition to 64 bit. We'll keep you posted as we go. Barbieri White Paper 'Handling the Reference Area': Barbieri published a White Paper which explains how to handle the Reference Area on charts created for Barbieri spectrophotometers. It's a good read even if you don't use a Barbieri instrument. Side note: You may notice the use of ColorThink illustrations throughout the article. We are starting our series of Instrument Spotlights with the instrument we most recently added to our Maxwell Client and Curve4 list of supported instruments. It also has the singular ability of prompting your spell checkers to redline. This is the eXact by X-Rite (small e, capital X). This is a superior measurement device that measures spectral wavelengths and returns density readings, L*a*b readings, or outputs the spectral measurements through software. What you get with a top-notch instrument like this is very accurate, very consistent readings. There are two different physical models of the eXact available - eXact and eXact xp - as well as several licensing levels for each model (from a basic unit that only supplies density, to the full-featured license that includes scanning and bluetooth wireless connectivity). X-Rite added the eXact xp unit when it was discovered that the polarization filters in the original model caused measurement problems with flexible film substrates - even when M3 measurements were not taken. They removed the M3 / Pol function for such users and voila, the eXact xp. These models and licenses range in price from around $4300 to over $8000. It has what's been called a "clamshell" form factor: The spot to be measured is aligned in the aiming reticle in the bottom plate. Then, the top, main section of the instrument, is pressed or folded down to meet the bottom plate and take the measurement. 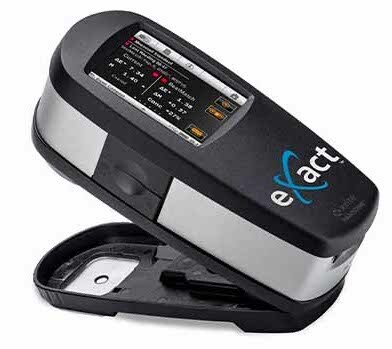 X-Rite has a long history of making quality spectrophotometers and spectrodensitometers. The company had a series of acquisitions where they absorbed Monaco, GretagMacbeth and Pantone, along with the instruments those companies produced. Eventually X-Rite had a slew of spectros with overlapping features and different model names. (504, 508, 518, 520, 528, 530, 552, 938, 939, 960, 962, 964... I'm sure I'm missing some...) In 2012, X-Rite came out with the eXact, which was designed to replace all of those earlier models. This kind of instrument has traditionally been used alongside a press to get solid ink densities and Lab readings. The more basic versions of the eXact certainly continue to provide those functions well, but the addition of the scanning capability has the potential to make this one of the most accurate profiling instruments you can buy. When used to take spot measurements, the eXact obviously does not require any specific chart arrangements. You aim and measure any individual color you want on any normal, printed sheet. For an additional price, a scanning feature can be added to the eXact. The instrument is fastened into a rolling cradle and can be rolled across a sheet, scanning an entire row of colored patches at a time. The original intent seems to be for scanning a long row of color bars, and the software X-Rite provides for extracting measurement data when scanning (DataMeasure) is suited for that purpose. This scanning feature now makes it possible to scan entire targets; anything from 2-3 row control strips to multipage profiling targets can be scanned, although the DataMeasure software would be pretty cumbersome for this purpose. More on that below. We have added support for the eXact to the measurement modules in the Maxwell Client and Curve4. In either of these apps, scanning with an eXact is as easy to set up as any other handheld instrument. We can even make use of target definition reference files that were made for other instruments. So you can use your scanning eXact to measure an i1Pro chart, or an iSis chart - or even a chart made for a Barbieri instrument. Depending on the model, the eXact can scan in M0, M1 & M2 modes (eXact xp), or all four M-modes: M0, M1, M2, and M3 (eXact). Visit colorwiki.com for more information on these measurement modes. The eXact can automatically switch between M0, M2 and M3 measurements (when available) but you must change a sliding filter switch to measure in M1 mode. When in strip-scanning mode, an interesting extra step is that the instrument wants a separate measurement of the white point at the beginning of a measurement session for M0, M2 and M3 measurements. At CHROMiX, we have been beating the drum for years for hardware makers to include the ability to make polarized measurements. The polarizer aids in making wet vs. dry ink comparisons. When making printer profiles, we have found that polarized measurements can draw out more detail in the shadows of matte papers and fabrics. So it is nice to see that M3 is included in this feature set. In our research with the eXact and comparable instruments, it is possible to get inconsistent readings with M3 measurements depending on the orientation of the instrument on some materials. So we recommend that the user position the instrument on the substrate the same way every time. Making a series of single measurements is not something that requires a lot of speed. That is good, because the action of pointing and then pressing the unit down to take the measurement is not as fast as some other devices that make taking single measurements a breeze. In our testing, we were able to scan in strip mode a 300 patch P2P target in about 1 minute, using the measurement module in Curve4. This is scan time alone, which does not include calibration time, time to launch software, place reference files, etc. This is in the ballpark of other row-scanning handhelds such as the i1Pro. However, the action of scanning is slightly more cumbersome than instruments that are originally designed for the purpose. There is no "ruler" to guide the instrument in its track across the page. (If your purpose is to scan long color bars, then this is a benefit.) On the cradle, a half inch of black line acts as a pointer with which to guide its path down a row. There are rollers on the bottom of the cradle, and that helps guide the unit in a straight line across the page. Finally, the unit is larger and heavier than other handhelds. Still, if you are an intrepid learner of new things, you can catch on to the unique way in which this unit scans. 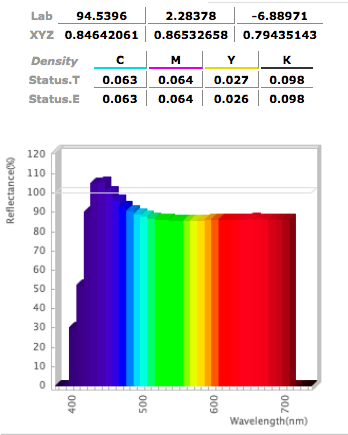 If scanning is going to be a big part of your use for the eXact, the fundamental accuracy of the instrument cannot compensate for poor scanning technique that might capture other colors outside the row down which you are leading the instrument. You must also be sure to use realistically-sized patches based on the aperture of your instrument. Don't use a 6 mm-apertured instrument to measure 7 mm patches, for example. If you hail from the market segment that trusts the i1Pro to be the pinnacle of accuracy, you might wonder what the eXact does that an i1Pro does not do. Aside from M3 measurements, some sophisticated on-board calculations, Bluetooth capability and on-screen results - the real answer is accuracy. The specs for this instrument show that repeatability of measurement on a white tile is 0.05 deltaEab, and the maximum difference between different instruments is 0.45 deltaEab. These are such small differences that they don't even come close to being detectable by the human eye. The eXact can take advantage of X-Rite's NetProfiler software which helps readings from this instrument align with those from other instruments. The eXact can be purchased with aperture sizes of 1.5 mm, 2 mm, 4 mm, and 6 mm. These are fixed aperture sizes and cannot be changed. A larger aperture size will tend to give a more complete sampling of the printed color than a narrower sampler area, so it's recommended to use a larger size if possible. - especially when measuring printing with larger dots. Most models of the eXact can can be ordered with Bluetooth capability and it cannot be upgraded after purchase. So within the limited range of Bluetooth, you can take your eXact to many places a tethered spectro can't go. Here, I am thinking of more than just going out on the floor and getting spot Lab measurements off the back of the display. With some CHROMiX software, you can be measuring proof pass/fail strips on a printer within Bluetooth range, and get the pass/fail result or other metric results on the eXact's own display immediately after measuring. X-Rite offers some free, basic software for using the eXact to measure and save the results. DataCatcher works with spot measurements only and allows the writing of data to a text file or a spreadsheet program like Excel. DataMeasure allows the scanning of a strip or a series of strips. It does not use a predefined reference file, so the page parameters for each chart arrangement need to be defined manually in the software. For example, the eXact requires the physical length of the strip (or the patch width) to be entered in order to scan. This is different from other handhelds. Also, it exports data into a .csv format for use in Excel. This works fine for many press-side uses. If you are measuring a profiling target (which is a little outside of its intended use), further manipulations need to happen in order to get the data into the CGATS text form that profiling packages want to see. Operation of the eXact in spot or scanning mode is much, much easier using Maxwell Client or Curve4 - especially if you already have charts and reference files that you use with other instruments. You need to be a Maxwell customer in order to use the Maxwell Client software for the long term. It can measure RGB, CMYK, and targets up to 7 channels. Curve4 is limited to CMYK (or other 4-channel which may be SCTV spot inks) targets only. The Maxwell Client will also display the resulting metrics on the eXact's touchscreen display at the end of the measurement, in addition to displaying them in the Maxwell Client and uploading the data to Maxwell online. The eXact follows the precedent of earlier models by limiting its spectral sampling to 400nm to 700nm. Other instruments (even those currently sold by X-Rite) have a wider spectral sampling of from 380 - 730 nm. 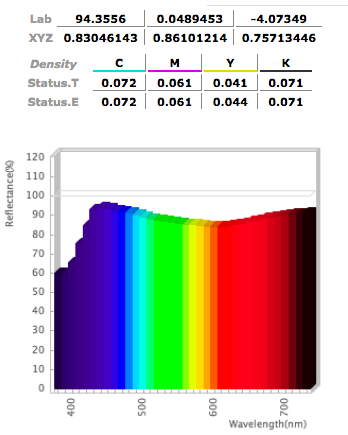 It's good to be aware of this in case you go looking for spectral bands and are puzzled when you can't find them. Here is an illustration of the spectral signature of a white patch measured with an eXact. Compare that with a similar measurement from an iSis. Whether or not this is a problem is up for debate in the industry. The presence of the lower bands can aid in detecting optical brighteners in paper. At the same time, the eXact seems to do a very good job of taking consistent, accurate readings even without the "extra" bands. If you get a model with all the bells and whistles, you can have a very highly accurate spectrophotometer that can take spot measurements or scan entire targets - in all four scanning modes - and do this all wirelessly. When checking pass / fail status of control bars on a sheet that is still on a press, you can remotely and wirelessly receive the status of your measurement right on the screen of the eXact. It is a bit pricey if you are just thinking of measuring profiling targets; however, those familiar with press-side spectrodensitometers won't be shocked by the price, and should be very happy with the performance of an eXact. See the eXact in action in this YouTube video. Entire Contents of CHROMiX ColorNews (c)2018 CHROMiX, Inc. CHROMiX, Maxwell, ColorThink, ColorNews, ColorSmarts, ColorGear, ColorForums, DisplayWatch and ProfileCentral.com are trademarks of CHROMiX Inc. All other trademarks are property of their respective owners. CHROMiX ColorNews is intended as an informative update to CHROMiX customers and business associates. We are not responsible for errors or omissions. You may not copy or reuse any content from this newsletter without written permission from CHROMiX, Inc.